Attending a College Fair is a great opportunity for students to explore schools and programs available to them after high school. Representatives attend and present information for students to review and learn which schools and programs satisfy their academic, financial and social requirements. Participating schools at a College Fair may include: four-year Colleges and Universities; two-year Community Colleges with Transfer Pathways; Art, Design and Technical Institutes; and Military Academies. 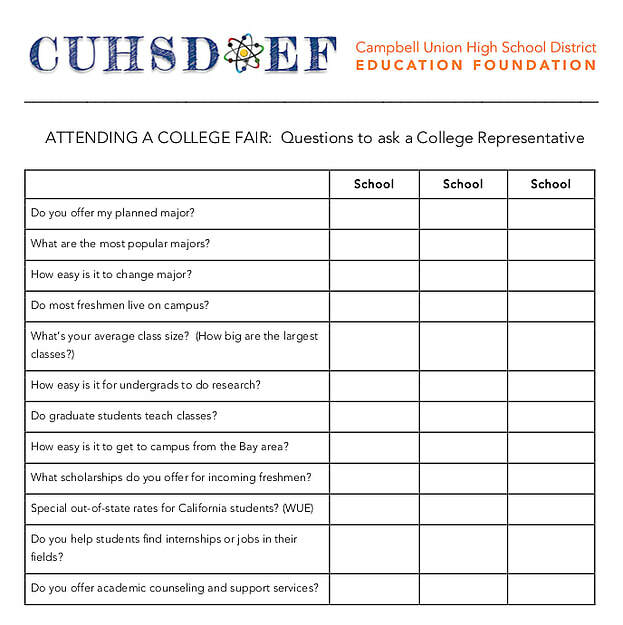 At the CUHSD Education Foundation, we hope students will use this resource page as their guide on the How to's of Attending a College Fair. Find out which colleges will be attending and write down the names of the ones you want to learn about. Both students and parents are encouraged to attend, but make sure the students do most of the talking (or even walk around separately from their parents.) It can be helpful to get a second opinion on your impressions of particular colleges and you might ask different questions. Visit the admission reps and ask questions. ​Leave time to browse. Speak to many reps, and try not to focus just on “known” schools. You may find one you’ve never heard of that offers the exact major, extracurricular program, etc., that you want. Ask yourself which colleges stood out and why. Organize the college material you collected and review it while it’s fresh in your mind. Recycle pamphlets of colleges you’ve ruled out. Do more research on the colleges you’re thinking about. Explore websites, contact the admission office or plan a campus visit. If you liked what you saw at the fair, it may be time to see the college in person. Update your “Colleges I’m Thinking About” list on Naviance. Download this College Fair Worksheet and take it with you to a College Fair. If considering a particular major, ask: how many students take that major; what research faculty members are involved in (and opportunities for undergraduates to participate); or what courses you would take your first year in a particular major. You should try not to ask “how good is major X?” College reps will not tell you that a program is bad - their goal is to promote all programs. Students who are undecided should ask about what services and support are available to help them explore various majors. Other things you can ask about: extracurricular activities; what kinds of students the college is looking for; what percentage of students receive financial aid; and other concerns unique to your interests and situation.